Over 1,000 of you have now voted in the MAG Ireland poll on mandatory high visibility clothing. The results deliver a stinging rebuke to the RSA’s proposal with more than nine out of ten saying “No” to mandatory high-viz. We asked, Compulsory High Viz – What do you think? There could scarcely be a more clear cut result. MAG Ireland is due to meet with the RSA on early in November, and we’ll be delivering your response to the very people who think they know what’s best for you. MAG Ireland would like to thank the dozens who e-mailed the office with your personal experiences of high visibility clothing, both positive & negative, and also those of you who invested time and effort in this debate. We’re aware that a substantial number of you already wear high visibility clothing when you feel it may have a positive effect, particularly during the hours of darkness and in poor weather conditions. We’re campaigning for your right to retain that choice. The RSA will require a far more integrated and nuanced approach if they are to succeed in their aim of improving motorcycle safety. You’ve told us that as riders you believe that even if wearing a hi-viz drivers will continue to offer the defence that motorcyclists are too hard to see so it’s not their fault that they didn’t look properly, when of course it is. MAG believes that the right to choose whether & when to wear high viz on your bike should be yours & yours alone. We support those who choose to do so, just as we support those who choose not to. 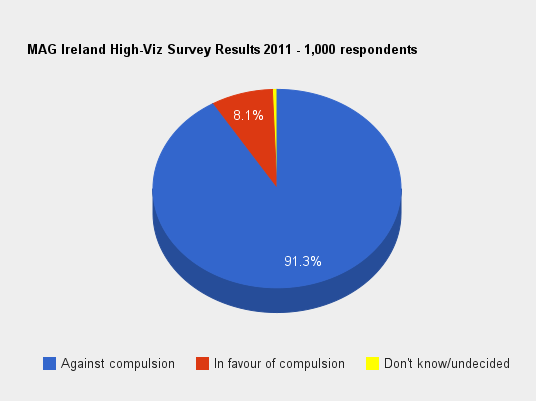 MAG Ireland remains implacably opposed to compulsion.